Deferred compensation refers to pension plans, 401K plans, IRAs and other retirement assets. Such plans are divisible as part of a property settlement in divorce regardless of which party is named on the plan. How they are divided depends on the value and nature of the asset. Perhaps one of the worst scenarios in a divorce is when these types of assets are transferred to a former spouse but the original owner is liable for liable for the taxes, including penalties for early withdrawal. Types of Retirement Assets: There are three main kinds of deferred compensation plans. There are "Savings plans", such as IRAs, 401(k) Plans, ESOPs, Thrift Savings Plans. There are also "Defined Contribution" plans. A defined contribution plan is one in which the value of the plan is determined in part by the amount of contributions made into the plan. The money contributed may be invested and grow. There are also "Defined Benefit" plans. With a defined benefit plan, an employee is provided a monthly payment starting at retirement age and ending at the end of his/her lifetime. Savings plans such as an IRA are considered "cash" plans since they may be liquidated before a person retires. They are divisible as part of a divorce. However, before any division may occur, a custodian of the account must receive and review a certified copy of the court order dividing the plan. Additionally, the spouse receiving a portion of the plan must fill out documents relating to the manner of payout. IRA proceeds may be cashed out and paid directly to the receiving spouse or they may be "rolled" over into a new IRA in the name of the receiving spouse. However, the tax consequences related to cashing out the plan may reduce the plan proceeds by more than thirty percent (30%) for taxes and early withdrawal penalties. Valuing and Dividing Defined Contribution Plans. The valuation of a defined contribution plan can be determined by multiplying the account balance by the percentage of vesting. This is a relatively simple way to value the plan and determine marital value. Generally, such plans may be divided currently with each party receiving one half of the current vested value. Valuing and Dividing Defined Benefit Plans. With a Defined Benefit Plan, generally the participant's benefits cannot be liquidated prior to retirement age and the non-participant spouse may receive a retirement plan in her name representing her marital interest in the participant's plan. This plan is generally subject to the same terms and conditions of the original plan. Often, the Participant may choose a payment method from several options. The chosen method will affect the amount or timing of the payments to both the participant and any receiving spouse. This may mean that benefits are received when the original participant decides to retire, not when the recipient spouse retires. A defined Benefit plan may be divided in one of two ways. Cashing Out/Present Value Calculation. First, a recipient spouse may elect to receive money effectively cashing out his/her interest in the plan. To cash out, a present value of the plan proceeds must be determine. "Present Value" is the current value of a future benefit. In simple terms, a dollar that you receive today is more valuable than a dollar you receive next week since you may invest the dollar or deposit the dollar and accrue interest. Therefore, benefits that are received at retirement age would have a lower value if paid in a lump sum currently. Often, a calculation or of present value requires an actuary or accountant. Division of Future Benefit. Rather than using a present-day cash value, a defined benefit plan may be divided by dividing the future stream of income. 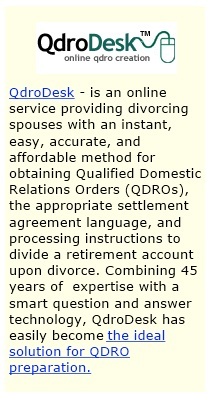 This is accomplished by drafting a Qualified Domestic Relations Order (QDRO). This is a court order which instructs a pension plan to pay an Alternate Payee (or former spouse) a portion of benefits accrued by a Participant due to an equitable distribution agreement in a divorce. With this method, the court retains jurisdiction until the benefits are paid. Attorney Maury D. Beaulier has practiced family and criminal law for over 20 years, helping clients throughout Minnesota and Wisconsin work through their legal matters. You can find out more at Minnesota Divorce & Family Law Center.